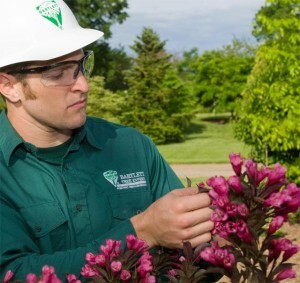 A specialized service offered at Bartlett is our MoniTor® program that involves one or multiple visits by a Bartlett Plant Health Care Specialist inspecting all woody trees and shrubs on a property for insect and mite pests, diseases, and cultural problems that could impact plant health. If insect, mite, or disease problems are found on the plant, a specialized product will be applied to suppress the problem. If cultural problems exist, recommendations will be made. The MoniTor program’s unique service is customized to the client’s property and expectations. Action thresholds are developed for pests on key plants based on the level of tolerance by the customer and plant species. It’s time to take action when the plant or customer has a noticeable reaction to the pests. The plant, its environment, and customer expectations are three important variables to understand for diagnosis and treatment. Client expectations greatly influence decisions in the MoniTor program. Discussing expectations should be done prior to developing and beginning a MoniTor program. Understanding the client’s goals for their property is a key component to a successful MoniTor program. It is important to understand the client’s perception of a plant situation. Clients have different tolerance levels to signs and symptoms of plant problems. Knowing the key plants on a client’s property and what plants the client really cares about greatly influence the design and success of the MoniTor program. Client education is another important aspect of the MoniTor program. Communication and understanding between the customer and Plant Health Care Specialist are key. Providing ongoing education on the different plant health care processes at their property helps clients know what to expect. The Bartlett MoniTor program balances the desires and goals of people and the needs of plants within the landscape setting they both share; this is truly a unique service. Todd has worked at Bartlett for five years as a groundsman, climber, plant health care specialist, Bartlett Inventory Solutions Regional Specialist, and Arborist Representative. In 2015 he was recognized as a Plant Health Care Specialist Champion for the Piedmont Division. He has a Bachelor of Science in Natural Resources Management from Colorado State University and a Master of Science in Forest Economics from Mississippi State University. He is a Certified Arborist with the International Society of Arboriculture, holds a Virginia Commercial Pesticide Applicator License, is a Certified Tree Care Safety Professional, is a Virginia Certified Horticulturist, and is Tree Risk Assessment Qualified.